Machine B is currently off-line. 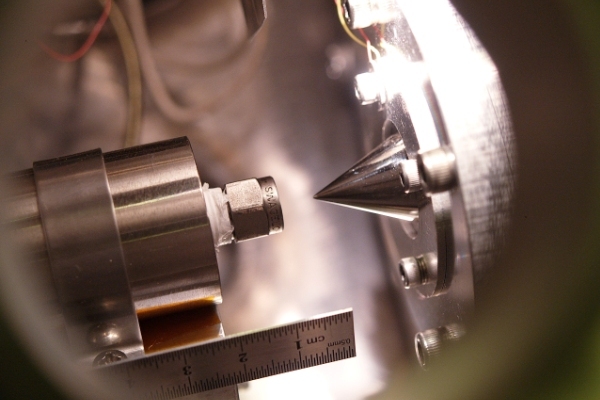 The last experiments carried out on Machine B focused on studies of the Rapid Expansion of Supercritical Solutions (RESS). Supercritical solvents can dissolve a variety of involatile species. Expansion of these into the gas phase provides an approach to forming beams of a variety of species and has potential practical applications in novel negative ion sources and the formation of nanoparticles of polymers, biomolecules, and ceramics. In collaboration with Prof. David Miller in the Dept. of Mechanical and Aerospace Engineering, we developed molecular beam sources based on the rapid expansion of supercritical solutions. 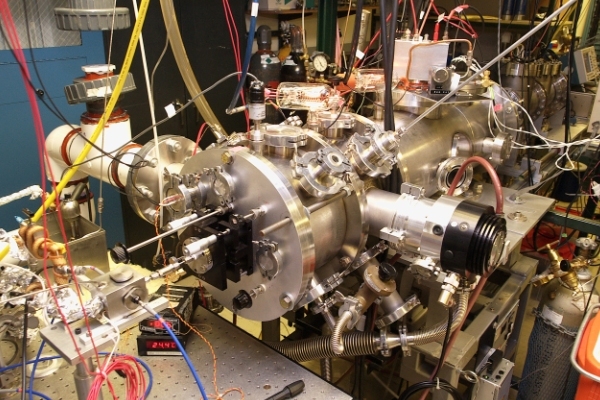 Machine B was modified to study supersonic free-jet expansions of supercritical fluids. A photograph of the machine is shown below, where the source is towards the front of the camera and the detection region extends backwards to the upper left-hand side of the photo. By interfacing our RESS source with Machine B we were able to study the size, composition and velocity distribution of the clusters and nanoparticles formed in the jet. In the figure below we show the nozzle-skimmer interaction and the structure of the supersonic free-jet expansion. More information can be found in Silvia De Dea's Ph.D thesis and in our publication, S. De Dea, D.R. Miller, and R.E. Continetti, "Cluster and Solute Velocity Distributions in Free Jet Expansions of Supercritical CO2", The Journal of Physical Chemistry A 113, 388 (2009).